Thematically, the book follows the life of a young girl into adulthood. In her early years, she’s lucky enough to become a simile. As an adult, she has aspirations to upgrade her status and become a metaphor. From this you will understand Embassytown by China Miéville is a science fiction novel with pretensions to be about semiotics. This is not to say it is any the less exciting as a human enclave struggles to survive on an alien world. Nor is it to say you will not enjoy the book if you cannot immediately tell the difference between a simile and a metaphor. Suffice it to say the capacity of the humans and aliens to misunderstand each other becomes a kind of parable through which to explore the concept of meaning and the various mechanisms we may devise for transmitting that meaning. And for those of you who like circuitousness, a parable is actually an extended form of analogy: a methodology of more abstract thinking for transferring meaning from one area of understanding to another which includes the methods of both simile and metaphor. For these purposes, semiotics is at the top of the food-chain as the metamethodology. Now we’ve got that clear, let’s move on to the plot. When humans meet aliens there’s a kind of hubris at work in the implicit assumption we will always be able to work out what they are saying. Even if they use a form of semaphore, waving their tentacles to each other in specific patterns, we tell ourselves we would be able to detect those patterns and attribute meanings. All it would take is a camera watching them in specific situations and, through their interaction with us, communication would inevitably follow. Except, of course, that assumes these alien beings see us as creatures with the intelligence to speak. Should we land on a planet and encounter a weird creature that sounded not unlike a cow, would we want to believe this was the basis of gossip about the latest episode of a soap on cable? There are always problems of perception and prejudice on both sides to overcome. So it is with the Ariekei. It takes an accident to create a concept in the mind of these aliens that we are capable of intelligible speech. As a simile it would be like an aborigine encountering Westerners for the first time and learning we understand that part of the background noise as music to be enjoyed. The problem is that, without exemplars, how does the aborigine qualitatively distinguish piano jazz from death metal? To our innocent, it’s all just noise. So why is some noise more enjoyable than others? Unless and until you know what a piano is and understand the range of sounds it can make, you cannot distinguish that noise from, say, a double bass or a trombone. You have to train your ears to hear the different instruments, either comprehending the whole or picking out individual contributions to the group effort. In any process of communication between two groups with different languages, the chances for miscommunication are high. The art of interpreting accurately depends on being able to define both the connotative and the denotative meanings. Language is not just superficial. It reflects the way we think and, more importantly, allows us to encode multiple meanings in simple phrases. So when two genuinely alien groups meet and they do not contrive an accurate method of communication, the relationship will exist on a shaky bridge that might collapse at any moment if one side inadvertently says the wrong thing. Out of fear, what is said and done will therefore be very small steps. No-one will want to take the chance of upsetting the agreement that allows the humans to stay on their world, nor disturb the small-scale trade which has some buyers fascinated by the alien biotechnology. When no-one’s sure what the other sides really wants, even simple bargaining is challenging. 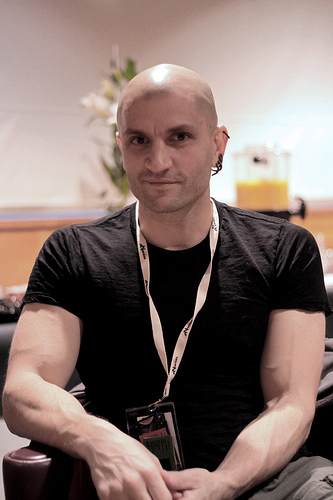 China Miéville doing the "before" picture for the hair restorer ads. When we start, the humans have been on the planet for several generations and our heroine is just about to make a name for herself — sorry that should be become a simile of herself. This is functionally important for the aliens but we humans have no idea what benefit the aliens derive from it. Our heroine then manages to leave the planet as a pilot, only to return some years later with her latest husband — a linguist/semiotician who’s always been fascinated by the few rather superficial reports of the Ariekei language. Joining them on this flight is a new ambassador. We actually learn a considerable amount about how ambassadors are produced and this latest addition to the squad comes from outside the usual circle. This difference has an unexpected effect on the aliens. Indeed, there’s an instant reaction to the first words spoken and, as they say, it’s all steadily downhill in interplanetary relations from then on. Indeed, before you can say antidisestablishmentarianism, the orthodoxy of the relationship is lost and, in their unique way, the aliens declare war on the humans. Since they are numerically superior, they will prevail unless our heroine can reach a better understanding of how their language works and, more importantly, how they think. I confess to being hooked by the premise and awed by the execution. Unlike China Miéville’s New Weird or fantasy horror books, this is spartan prose — highly functional and without adornment. It takes the concept and thoroughly explores all the implications, never blinking when it’s necessary to deal with potentially horrific mutilation. In their struggle to come to terms with the human threat, some of the aliens break down physical barriers. Others work on a more intellectual level. So, taking the book as a whole, it’s a metaphor for how an individual changes his or her worldview or Weltanschauung. To survive, we all need an intellectual structure for holding and expressing our knowledge and understanding. This depends on a continuous interaction between what we perceive and the language we use to label and relate to the things perceived. When we want to remember a thing, we need certainty we are recalling the right information. We want that thing and that thing only. Fortunately, our heroine remembers this and is able to communicate it to the different alien groups in a way that restores order to society. Things can never be the same but, at least, neither side will knowingly wish to kill the other (for now at any rate). Perhaps it seems premature to be talking about favourite titles by China Miéville. He has only written eight novels. But, for me, Embassytown is in the top three. It may not be his best by quite a wide margin, but it’s so far ahead of most of the other science fiction books published this year, it should be a serious contender for a Hugo, Nebula or something equally prestigious. 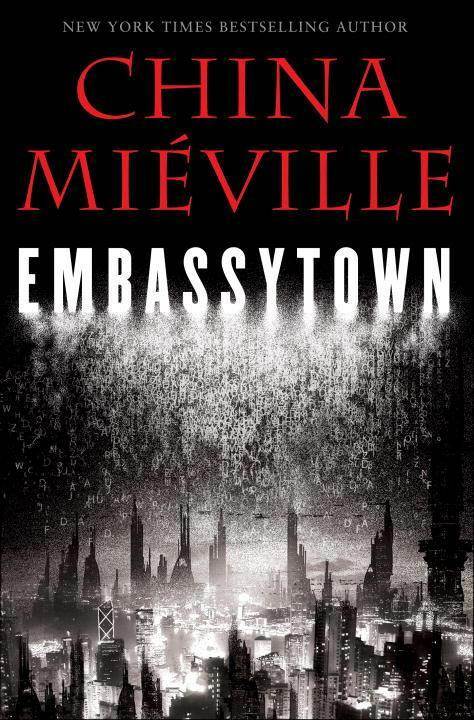 For all the reviews of books by China Miéville see: The City & the City, Embassytown, Kraken and Railsea. As an aside, Embassytown has been shortlisted by the British Science Fiction Association for the Award of Best Novel 2011, for the 2012 Arthur C Clarke Award for Best Novel, for the Nebula Award for Best Novel 2011, for the 2012 Hugo Awards for Best Novel and for the 2012 John W Campbell Memorial Award. It won the 2012 Locus Award for Best Science Fiction Novel. you had me at parable, as in this book is a giant one regarding the hubris of thinking you’re too smart to get lost in translation. I adored Embassytown. It’s up there with The Scar as my favorite Mieville. It’s a relief to find brain food that’s actually good science fiction although, thinking about different levels of meaning, are you referring to Lost in Translation by Sofia Coppola? I just want to make sure we’re both on the same page. ahh, someone who finally got that reference! I am indeed referring to the Coppola film, but also taking it a little bit further in the direction of first contact stories where the humans think we have a clue what’s going on, when of course we haven’t. Ever read Peter Watts’ Blindsight or Mary Doria Russell’s The Sparrow? Two excellent first contact stories where everything possible gets lost in translation. I read Mary Doria Russell’s The Sparrow when it first came out. It’s quite interesting but it went on too long. A more interesting book about the use of language to communicate or to lose meaning in translation, in this case with children, an Amazon tribe and aliens, is The Embedding by Ian Watson. I’ll have to check out that Watson, thanks!